Now Available! Five Minute Sword Fight is now available for purchase! You can buy it at any of our shows or from Game Crafter! 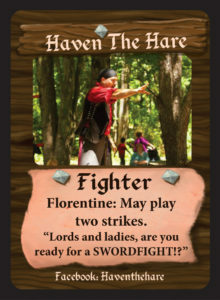 Five Minute Sword Fight (formally The Swords of Valour Card Game) is a fast-paced card game based of our sword fighting show that you can play anywhere and gives you the opportunity to join us in the list, just without all the years of pesky training, conditioning, or chance of bodily harm (other than the occasional paper cut). In the game, each player will take on the role of one of the Fighters and using the Combat Deck to strike, block, and grapple your way to victory! With the advanced rules, you can play as the members of the Swords of Valour and our friends by collecting the Character Cards. You can find the character cards by meeting the Swords of Valour and our friends or through our store. We have asked some great people to join us in the project. The game was designed by Haven the Hare (Allen R. Bernstein at Screamin Bunny creations). Graphic Design was done by incomparable Matthew Brennan (BlueTea1400 Illustration). Most of the photography was done by sneaky Patrick Dove (Dove Photography). Special thanks to Adonis Pointer, Between The Covers Bookshop, and the many that helped with testing and feedback over the years. If you want to know more, here is the rule book for the game! Five Minute Sword Fight is made of Strikes/Blocks, Press, Grapples, and Wild cards. Each card does something a little different so let's cover those now. Strike/Block: Strike/Block cards are the core of the game. The top of the card are strikes and are red, the bottom of the card is black and are the blocks. There are 4 types of attacks and blocks, High, Side, Low and Diagonal. 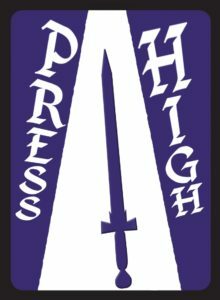 Press Strikes: There are two (2) Press Strike cards for each type of strike. These can be played at any time by any player. Takes two Blocks to block a Press Strike. If the Defender successfully blocks the Press Strike, they choose which strike to use from the two cards played. Grapple: Grapples can be used to Block any Strike or Press card, but also restart the round and are explained in detail later. Wild: Wild cards can be either any Strike/Block combination but not a Grapple. The first player to five (5) points or the player with the most points when the combat deck runs out, wins the game! The combat deck runs out when there are not enough cards to bring all players to a hand of five (5) cards. The dealer is whoever owns this game. Dealer shuffles and deals 5 cards to all players. The dealer will also deal cards to players whenever necessary. The first player will be the last person to visit faire. If tied, then last to see a Swords of Valour show. Stilled tied? RPS! (Rock, paper, scissors). The first player chooses a strike/block card from their hand and chooses the player they are striking. Place this card in the center of the table starting the Fight Stack. 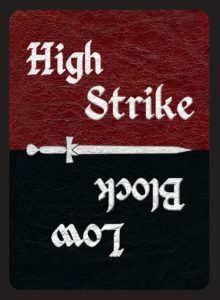 The top part of the card shows the type of strike, High, Low, Etc. The second player that had the card played on them now sees if they have a card with a block that matches the strike, High, Low, etc. If they do, they add that card to the top of the Fight Stack. Lastly, they pick another player to strike using the top part of the card just played. This continues until a player does not have a block that matches the strike played on them (this includes running out of cards), then the player that played that card scores a point, and places the Fight Stack in front of them to represent that point. Once a point is scored, any player that did not score a point may discard any number of cards. The dealer deals out new cards to each player taking them back up to five (5) cards. Some strike cards that say “Press” on them may be played at any time. If multiple players play a Press card at the same time, settle with RPS. The player that played the Press card then declares who they are playing it on. A Press strike takes two blocks of that type to block. The defender then chooses which strike to use from the cards they played. Grapple: Grapple is played as a block card to any strike card. The player that played the Grapple takes the Fight Stack, minus the Grapple card they just played. Take one card from the top Combat Deck, shuffle those cards and deal them back out to the players involved in the fight so far so that all players have the same number of cards in their hand as when the fight started. Place the Grapple card to the side and start a new Fight Stack. The player that played the Grapple now starts the round again by playing a card to the Fight Stack. If another Grapple is played, place it on top of the previous Grapple card and repeat the same process as above. Once a player reaches five (5) points or the player with the most points when the combat deck runs out, wins the game!. The combat deck runs out when you cannot deal new hands to all players. NOTE: For a game with more than two players, additional decks will be needed. For every two players, add an additional deck. 3-4 players: 2 decks, 5-6 players: 3 decks, etc. One of the things that makes Five Minute Sword Fight different from other games is the ability to collect Character Cards from REAL people that you have meet. You can collect Character Cards from the members of the Swords of Valour and their friends at events that they are at (or purchase them from our store). 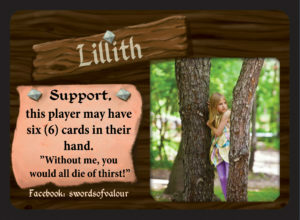 These Character Cards come in two types, Fighter and Support. A Fighter cards are printed vertically and Support cards are printed horizontally. These cards have abilities that change the strategies of how you play The Swords of Valour Card Game. Starting with the first player at the start of the game before they play a strike card, they may choose one (1) Fighter card or one (1) support card and place that card in front of them. These Character cards will remain in play the whole game. This card will stay in play until another card makes you discard it. After the Strike card is played, the next player to the left now may choose a Character card to play before playing their Block card. This continues for each player. Only one Character card may be in play at a time. IE, there can only be one (1) Captain Calla Lillie card in play at a time. 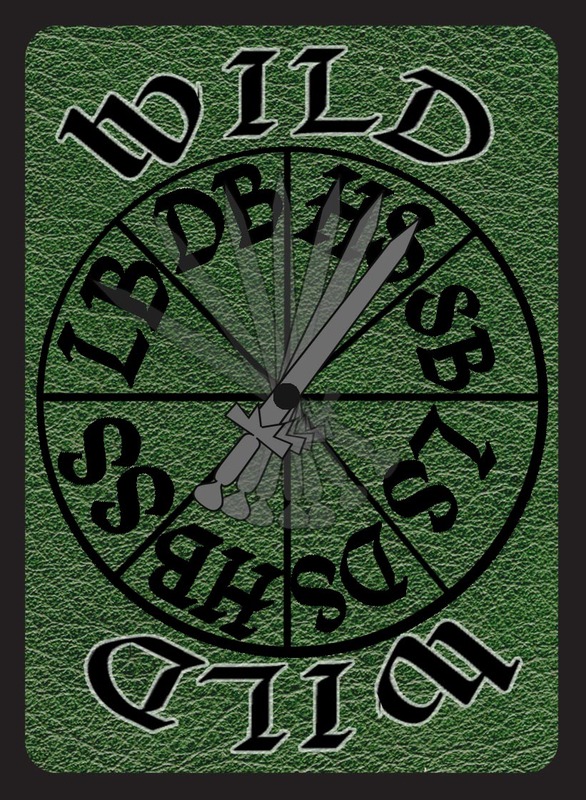 After all players have one (1) Character card in play, each player may now play another Character card of a type that they do not already have in play. IE, if you already have a Fighter card in play, you may now play a Support card. If there are not enough Characters Cards for each Player to have the same amount, either Fighter or Support, then stop choosing Character Cards for that amount. IE, Every player only has one Character Card or every player has two Character Card. If two cards have the same ability, like “Whenever a Grapple is played, this player goes first” use RPS (Rock, Paper, Scissors) to decide which player gets to use that ability. This is every time the ability is used.